The good news keeps on coming! 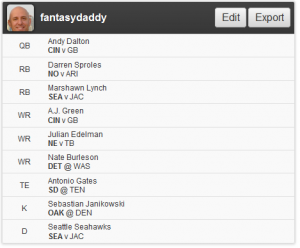 This week, FanDuel Partners is bringing you the Friends of FanDuel contest like you’ve never seen it before! The tournament has a juicy $1,500 prize pool, and costs only $5 to enter. On top of $1,500 in cash prizes, the top five finishers will get a satellite ticket for our FFFC SuperQualifier in Week 11! The SuperQualifier will award 20 trips to Las Vegas to compete in the live final for our $3,000,000 FFFC, and that tournament costs $200 to enter – circumvent that buy-in with this exclusive opportunity to win satellite seats! 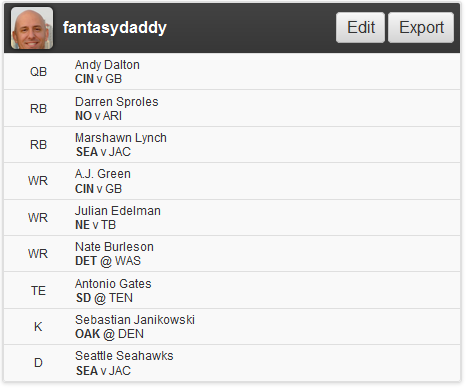 Full disclosure, this is my team for week 3.